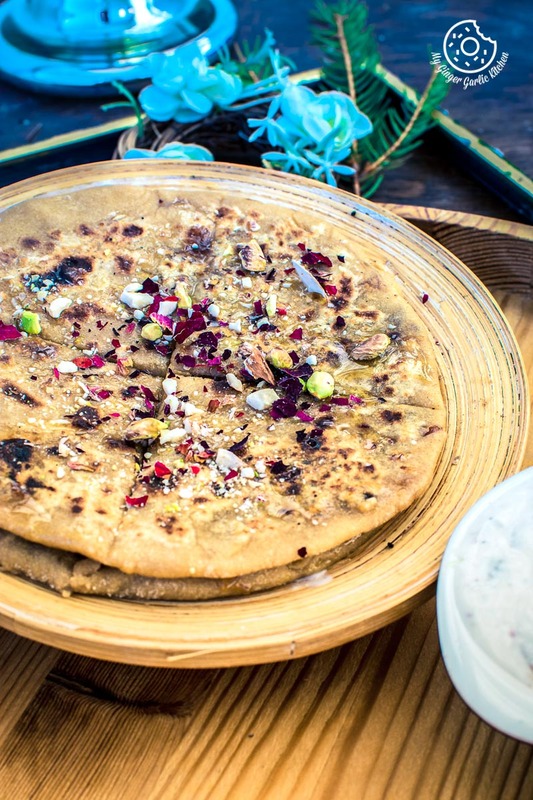 How to Make Gulkand Dessert Paratha With Gulkand Raita. This dessert paratha is one of those splendid painless dessert parathas which can only be made with only a few ingredients. 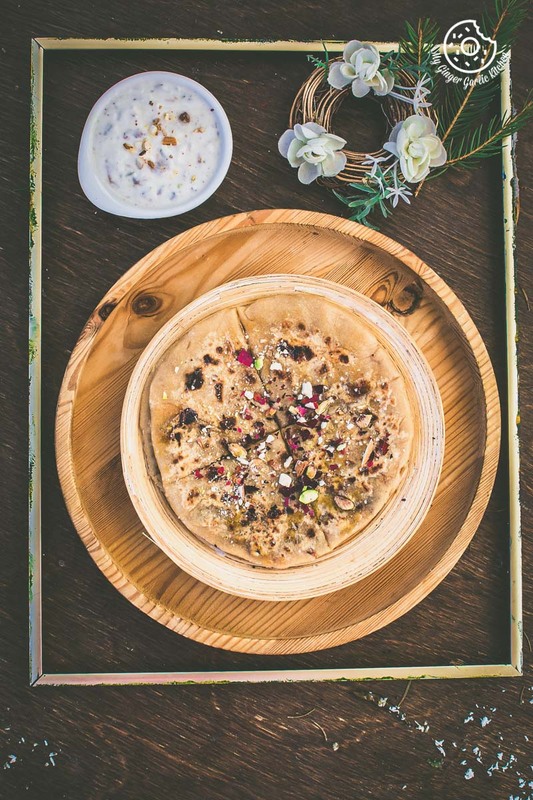 This rustic but nutty and pungent gulkand paratha is extremely fuss-free and so full of amazing textures and flavors which are really hard to describe in words. You just need to mix 5 main ingredients, and one of the most delicious dessert stuffing and raita base is ready. The mixing part takes only 2 mins. Isn’t it cool? Rest of the process includes making paratha dough which is also an easy task. And if you have a food processor then making the dough part is also a piece of cake. When I make these gulkand parathas what I usually do is to use the leftover dough. Have I mentioned that I always keep paratha/chapati dough in my refrigerator, because a paratha hankering can strike me anytime? And when that craving pitches, I absolutely don’t have the endurance to make the dough. So it’s a good approach to keep the dough ready in the refrigerator and use it at room temperature. Well, on some rare days when I don’t even have that little time or patience, I simply warm my dough in the microwave for 30 secs. And voilà, the perfect chapati dough is ready to work with. And I am telling you, this, that if you make it once, you’ll want to make every month from then on. 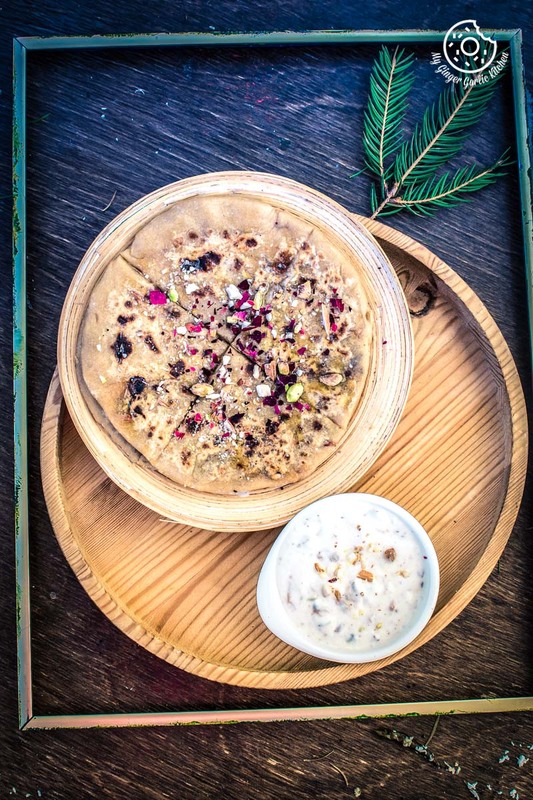 Yes, these dessert parathas and raita are so addictive. 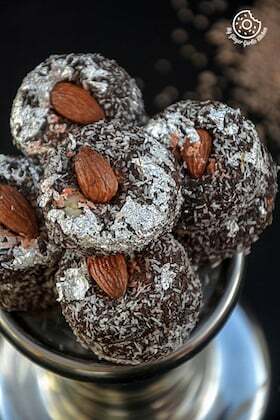 Plus, they are super easy to make. 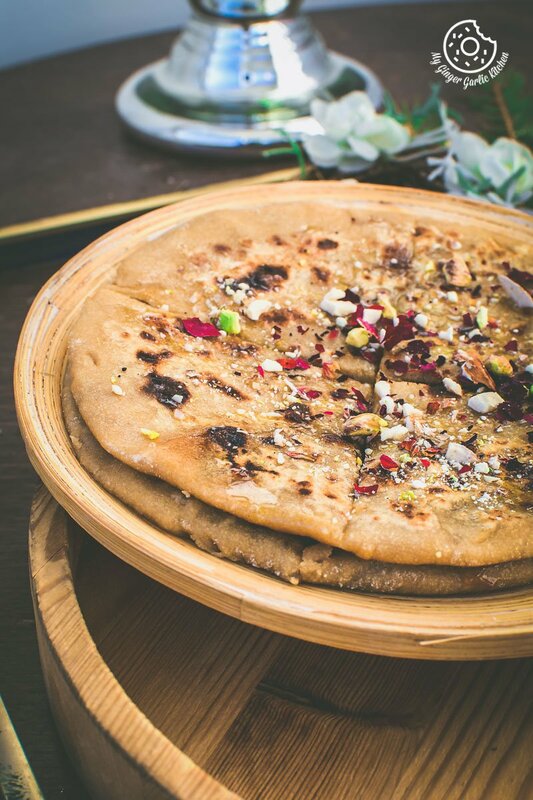 This incredibly scrumptious Gulkand paratha recipe is the next recipe in my Gulkand recipe series for Holi. That means this would make a great dessert for Holi. The invention of this recipe took place back in 2014 when I had some guests coming home for dinner, on a short notice. 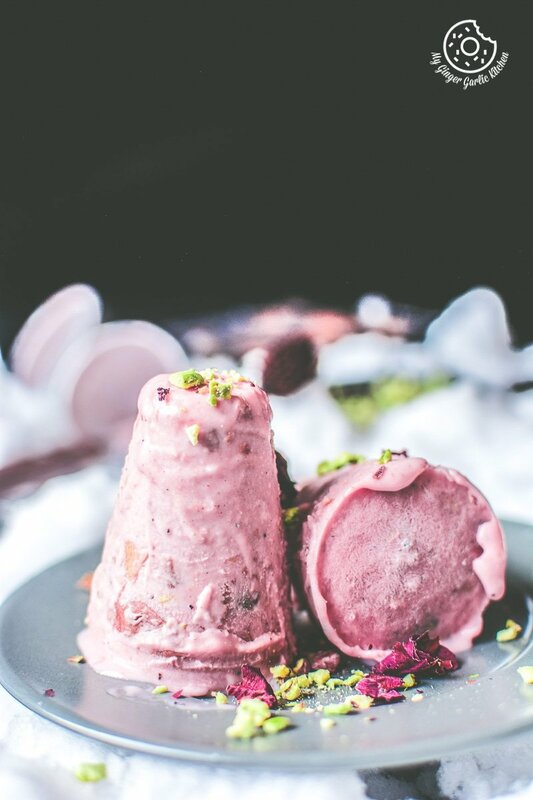 For dessert, I found nothing but a jar of this gulkand at home, and I really wanted to create something cool and unusual with this rose preserve. No wonder at the end, these parathas were an ultimate favorite with everyone who tasted it after dinner. This rustic but nutty and pungent gulkand paratha is extremely fuss-free and so full of amazing textures and flavors which are really hard to describe in words. After that dinner, I told this recipe to all my friends who came for dinner but never got a chance to share it on the blog in spite of making it quite often. Isn’t it strange? 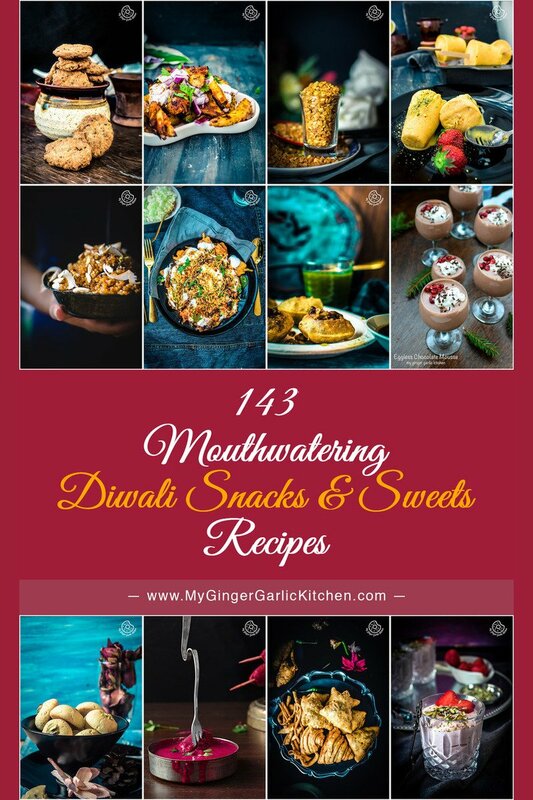 But thankfully this gulkand recipe series pushed me to do so. And now finally here it is, presented just for you. This is one of my most favorite dessert parathas along with chocolate paratha, sugar paratha, banana paratha, and coconut jaggery paratha. I just can’t believe that I have never shared a dessert paratha. I guess I should share them all with you soon. Because all of the above-mentioned parathas are sinfully delish and addictive. 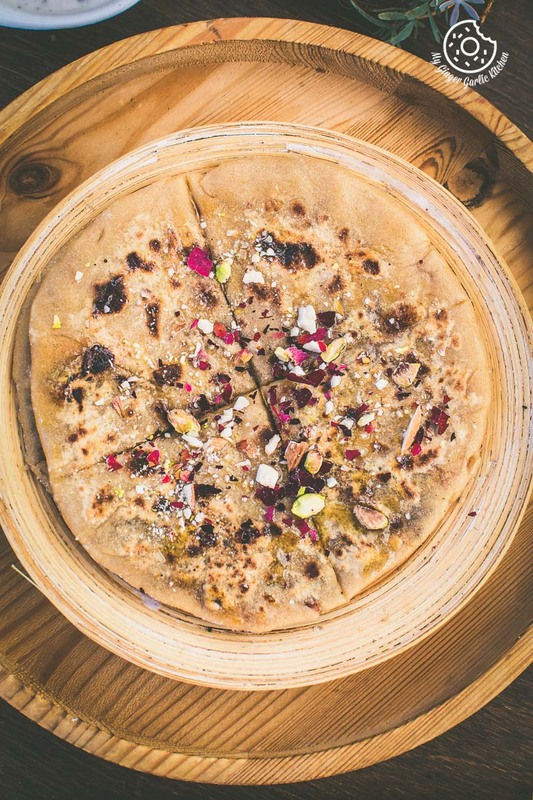 These dessert parathas are certainly one of those things — ‘dishes you need to taste at least once in your life’. Making this is magnificently easy. You can check it for yourself. Paratha: Easy to roll up, stuff, and roast. It is also effortless to substitute with few ingredients, in case you have some kind of intolerances. You could also store the stuffing in the refrigerator and use it up to a week. I used ghee for roasting parathas because it makes the paratha taste richer and more decadent. If you are not comfortable with ghee, then you can simply use any vegetable oil. This is one of the quickest things you will put together, especially if you have guests coming. 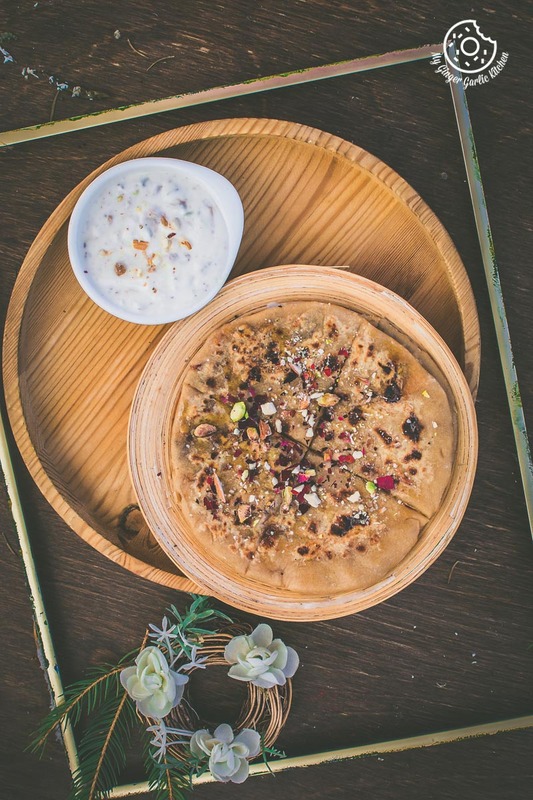 A slice of this hot gulkand dessert paratha dipped into chilled dessert raita really goes a long way. These parathas are pretty beautiful undressed and simple. But you want to go a step ahead and prettify even more this pretty thing, then simply adorn these with honey, nuts, and dried rose petals. This dessert paratha is one of those splendid painless dessert parathas which can only be made with only a few ingredients. 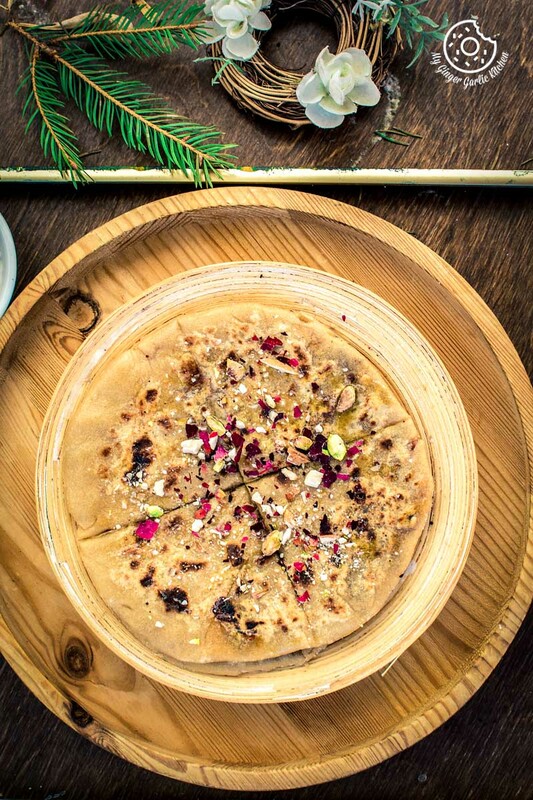 This rustic but nutty and pungent gulkand paratha is extremely fuss-free and so full of amazing textures and flavors which are really hard to describe in words. 1. In a mixing bowl add gulkand, fennel seeds, sesame seeds, cardamom powder, chopped nuts and mix well to combine. 1. Spread some flour and roll out one dough ball into a circle of 4″ diameter. 2. Place 1 tbsp gulkand mixture in the center of the dough circle. 5. Roll out again into a circle of 6″ diameter with the help of some flour. 6. Heat a pan. Roast rolled circles from both sides. 7. Apply ghee on both sides. Roast until golden brown from both sides. 1. 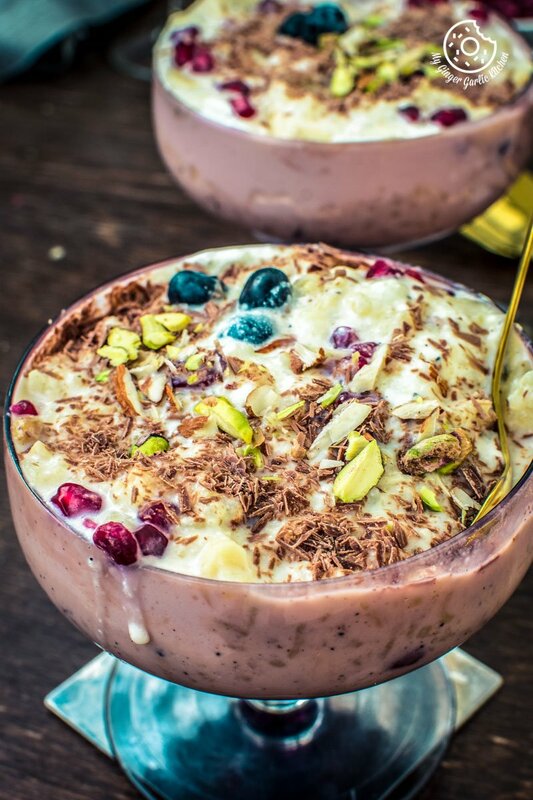 In a mixing bowl add yogurt, gulkand mixture, honey and whisk well. 2. Refrigerate for 30 mins. 1. Cut parathas into 4 pieces. 2. Drizzle with some honey and sprinkle with chopped nuts and dried rose petals. 3. 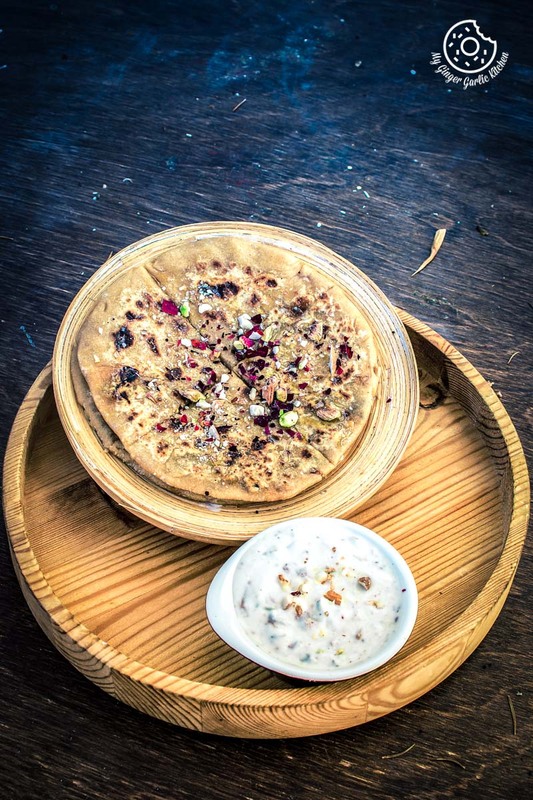 Serve hot gulkand parathas with chilled gulkand raita.